En esta primera historia, The child, us into the issue of child labor. The film shows the harsh working conditions of children stonemasons living in the suburbs of Lima. In this sense, it highlights the description of the lack of health and safety conditions in carrying out their work. Through the main character, Guinder Rodríguez, we know the context impoverishment suffered a major part of the population of Peru. They are migrants from rural indigenous origin, that in the absence of alternative livelihood in the area decided to march to the city in search of work. But there are unemployed and end up joining the ranks of the informal economy, trying to invent work to survive. And this lack of employment and poverty is what leads to children have to work to bring others to the household income. “Here in Peru, as there is no work, we have to work even children ", say. The work becomes part of the daily life of children: get up early to go to work, spend the day at the quarry, play the spot, are socially organized to defend their rights, laugh and have fun at the circus with a purpose of work jokes, etc.. It is children who socialize and build their identity based on the work. But this child labor takes place in spite of the will of parents. 1. What are the working conditions of children who appear in the film? What problems in terms of health and safety think you may have for these children the way they perform their work? Explain your answers. 2 .What impression produced by parents who appear in the film talking, the work of their children? How do you justify the work that children? What what else has drawn attention? Explain your answer. 3. As you see in the film the characters are children in addition to working very hard, juegan y sueñan con algún día con ser futbolistas o ir a algún país como “España” en el cual como dice el protagonista los niños no trabajan ¿Qué piensas sobre la vida que les a tocado vivir a estos niños? After watching this documentary? Do not think that many of your peers do not value what they have? Explain your answer. 5. 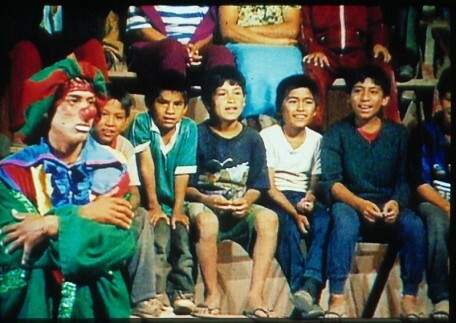 ¿Por qué les hace tanta gracia a los niños trabajadores las bromas de los payasos del circo sobre el trabajo? Explain your answer. 6. Do you think that in the film there is a certain understanding for certain forms of crime? What do you think about?. 7. How should address the phenomenon of child labor, from eradicating or from regulation?. Explain your answer. 8. What is the Convention on the Rights of the Child?. ¿Qué artículos de la Declaración Universal de los Derechos del Niño se violan en este documental ? Recurso UNICEF: Historias conectadas, trabajo infantil doméstico. No me ha gustado la película no es correcto que los niños y niñas estén picando las piedras para poder comer. La vida de los niños y niñas del cortometraje es muy dura ;comparada con la vida que nosotros tenemos . Tienen que madurar trabajar los mismos trabajos que hacen sus padres etc. La película no me ha gustado, muestra las duras condiciones de trabajo de los niños y niñas picando piedras para poder comer.Estos niños deberian de tener infecciones,problemas de salud y las condiciones de seguridad que desempeñan su trabajo.Estos niños y niñas en vez de trabajar deberian de estudiar y disfutar….